A wise man once said that the difference between marketing and effective marketing is very simple – one is saying you are good and the other… is getting other people to say you are good! Which opinion would you trust more? Take for example your beauty salon – you might offer the most cutting-edge high quality hairstyling services but if no one talks about how good they are or recommends them to their friends, your top notch quality remains unnoticed. Luckily for you, setting up an affiliate marketing program might prove an effective solution. In a sense, an affiliate program is more or less a referral program which provides other people with the chance to promote your products or services and receive a commission for it. For example, they could receive a commission of any salon booking that you receive from people they referred, or It could be off a physical product that their audience purchased from you. Not sure how to create an affiliate program and where to start? An effective way to generate a digital word of mouth and set up such an affiliate marketing program could be to contact some beauty bloggers from your local area, for example. Invite them to come visit your salon, test a new service and write a blog review, or even produce a vlog. Provide them with a special tracking code generated for the purpose of the affiliate marketing system. This personalized tracking code might for example give their followers a -25% off their next salon visit to get them excited about your salon. Or a free massage when they book a hairstyling appointment. The tracking code can be generated to specifically land on your website and your digital booking system – if you happen to have one. So you know why it’ truly a win-win situation? Your salon is guaranteed exposure to new audience, while the blogger gets a commission. Sweet, right? 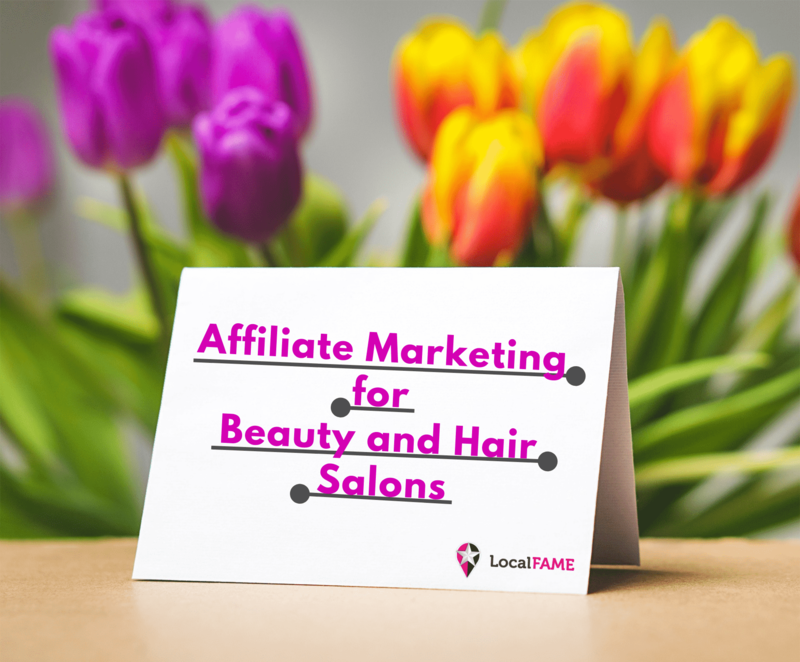 Now that you know what affiliate marketing is and more importantly WHY it is important for your salon business, it is wise to consider a handful of aspects before you kick it off with your own affiliate program. Pricing – Remember that for every booked customer or a product purchase you are giving a commission to your affiliate. It might be a good idea to consider raising your prices a bit to make up for the commission fee. Affiliate system and website suitability – Make sure that the affiliate management system that you use is suitable for your website platform and that you can generate a specific tracking code. Landing page – which page are you going to use? Will you create a specific one for the affiliate marketing program or use an existing one? Precise program terms and conditions – set specific guidelines for your affiliates. Consider commission amount, payment method, etc..
Now that you’ve laid the foundation for your affiliate marketing program, the next step is to optimize the process and strive for even greater success. The more people you are trying to target, the more you should be looking for new potential affiliates every day. The more, the merrier. The more different, the more various your target audience. Sometimes less is more, but in this case… more is more! PDF Topic: "Your Best Affiliate Marketing Strategy"
The perks of an affiliate program is that for every new affiliate you get their e-mails. So why not spark their passion into promoting your salon with creative, inspiring and personalized affiliate e-mails for example? Reflect on Your Progress. Learn from It. Repeat. Naturally, as your affiliate program develops, you need to take extra care in measuring the results. Knowing what you do well can help you get even better. Knowing what you lack can teach you a valuable lesson. Learn from it. Repeat.